ADOPTION DEBATE – THIS HOUSE SUPPORTS NON CONSENSUAL ADOPTION? Four barristers will present the arguments both for and against, followed by brief presentations from a diverse panel of experts. The debate will then open to the floor and at the conclusion all will vote. The barristers have agreed to assist in the presentation of the arguments for and against non-consensual adoption as a springboard for discussion, and the arguments they present do not necessarily represent their personal views. The barristers were allocated roles in the debate having agreed to participate. This event is open to all and is free of charge but places are limited and you will need to book your place in advance here, via the UWE website. We expect demand for this event to be high. In the event that you cannot make it PLEASE email Emma Whewell at UWE (Emma.Whewell@uwe.ac.uk) so your place can be reallocated. Please read the GROUND RULES for this event – they are what makes it possible for the organisers to run events of this sort and all participants are expected to stick to them. His Honour Judge Wildblood QC is running a competition for the best ten poems for children, with the intention of seeing if funds can be raised for the Personal Support Unit and for the provision of early therapeutic intervention for young parents. If you or someone you know would like to enter the competition please send the poem or poems to Paul Bryson of the Personal Support Unit at Bristol@the psu.org.uk, marked ‘for Paul Bryson, poetry competition’. Poems can be written by adults or children but should be intended to be read by children aged between five and thirteen. They may be any length and must be the original work of the person on whose behalf they are sent. The closing date is 31st March 2016. Mr Justice Baker and Ms Helen Andrews (the court manager at Bristol Civil and Family Justice Centre) have kindly agreed to judge the poems, after a sift if necessary, and will identify the best ten. We will then see if we can get them published in order to raise funds. 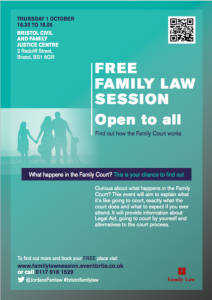 Following the success of the first free family law session at the Bristol Civil and Family Justice Centre in October of last year, a second free Bristol family law session is planned to take place on Wednesday 20 January 2016 from 18:00-20:00 at the University of the West of England, Frenchay Campus, Bristol. The event is aimed at anyone interested in finding out more about the Family Court, all professionals working in the field of family law, journalists and students. Join HHJ Stephen Wildblood QC, designated family judge for the Bristol area, and a panel of experts to hear about the work of the Family Court and what to do if you are faced with a personal or family disagreement. Following feedback from the first event, new topics and speakers have been added and the question and answer session will be extended to promote further debate. You may apply for a place here. Registration and refreshments will be available from 18:00. The event will start at 18:30 and finish at 20:00. For more information visit www.familycourtinfo.org.uk; the site is aimed at people who are involved in or may be involved in a case in the Family Court in this area (Bristol, Weston, Gloucester and Bath). It sets out the range of help that is available locally, and provides basic information about how the Family Court works. Information about parking etc is on the UWE site. any future hearing date or deadline. Please put all of this information in the subject line of any e-mail or any correspondence you send to the court. This will enable the court to prioritise correspondence appropriately and ensure it gets to the right Judge. The only e-mail address which should be used is family@bristol.countycourt.gsi.gov.uk. I am sending out this newsletter to ask people please to ensure that they are aware of two things. Firstly, the orders that may be made under the inherent jurisdiction of the High Court to retrieve children who have gone missing; these are commonly called ‘Tipstaff orders’. Secondly, to give some help in relation to Section 98 of The Children Act 1989. Under the inherent jurisdiction of the High Court, orders can be made to assist in retrieving children. Amongst the wide range of orders that are available there are three very specific types of order. They are called collection orders, location orders and passport orders. Each order has two parts. One is the directed to the Tipstaff and directs the Tipstaff to assist in implementing the court’s order. The collection order provides that the child is to be found and placed in the custody of a named person until there is a further hearing before the court (which must take place within three days of the child being found). The order usually permits the Tipstaff to enter premises to retrieve the child and to arrest anyone whom he has reasonable cause to believe has disobeyed or obstructed the order; anyone so arrested must be brought before the court as soon as practicable but in any event no later than the working day immediately after arrest. The collection order also contains other ancillary provisions. A location order is similar to a collection order but provides for the child to be located, rather than collected. Thus it is a less invasive order. A passport order involves control of passports. All three orders may provide for the surrender of passports and the prevention of applications for further passports in relation to the child. The Tipstaff keeps draft forms of each of those orders. The drafts may change from time to time and that is why standard draft forms should always be requested from the Tipstaff himself before any such orders are made; they are not held by the court offices and are not for general release. The Tipstaff, Richard Cheesley, can be contacted by the court from the global email address facility or may be reached by telephone – 0207-947-6200. He, or one of his assistants will be available at any time (‘24/7’). There is a brief explanation of his role in Paragraph 7 of PD 12B of The Family Procedure Rules 2010. These orders can only be made by a High Court Judge (which includes a Circuit judge with High Court authorisation). It is imperative that any orders that are made should be drafted in the correct form. Once made, they are very effective indeed. Please also ensure that you are aware of the port alert procedure under PD12F, paragraph 4 of The Family Procedure Rules 2010; it is in the Red Book. As to section 98 of The Children Act 1989, this is the provision that relates to self incrimination in public law proceedings. It does not apply to private law proceedings. A lawyer acting for a client where the issue of self incrimination might arise must give advice to that client about it. I have been asked for some guidance about the possible wording of a warning that might be given. I do so with some hesitation because I need to stress that the guidance that I am giving is not necessarily the correct terminology for all cases and it therefore remains the duty of individual lawyers and courts to consider the case before them and adapt the wording of any warning that is given. However, with that strong caveat, I have attached some possible draft wording that might be used in a public law case. 1. I need to explain to you now a rule of law. It is important that you understand what I am saying. If you do not, you should ask me to explain it to you further. 2. As you know allegations are made against you within these proceedings. These are family proceedings and not criminal proceedings and it is not for this court to decide whether you should be convicted or acquitted of any criminal offences. Within these proceedings however, the court will have to decide whether the allegations made against you by the Local Authority are true or not. If those allegations were shown to be true that would mean that, insofar as these proceedings are concerned, you would have committed misconduct of a criminal nature. 3. I have to warn you therefore that, within these proceedings, you are not permitted to refuse to give evidence or file documentation on the basis that to do so might tend to show that you have engaged in conduct of a criminal nature. When and if you give evidence or file documentation, you may not refuse to answer any questions (or refuse to provide documentary evidence) that might tend to show that you or your spouse (or civil partner) have engaged in such conduct either. 4. If you do give evidence that suggests that you have committed criminal misconduct, that evidence would not be admissible in criminal proceedings against you, except in relation to any prosecution against you for perjury. Section 98(2) of The Children Act 1989 states that that is so. If you were to lie deliberately within these proceedings that could lead to you being prosecuted for perjury and what you had said could be put before the criminal court against you. 5. However, it is important that you understand that, if the court gave permission, anything that you do say or file in these proceedings might be released to the police for them to use during their enquiries into any allegations that you have committed any criminal offence (and by ‘any offence’ I am not referring just to perjury). Further, if you were to be prosecuted there could be applications in the criminal court for the prosecution (or any co-defendant) to cross examine you about anything that you had said in these proceedings. It would be for the criminal court to decide on whether they should be permitted to do so. 6. Your lawyers will explain this warning to you further. It is their duty to do so.